Jonas Mekas has spent 94 years weaving himself inextricably into the very fabric of postwar culture. 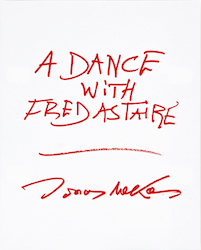 In his photo book A Dance with Fred Astaire, Mekas recalls his many chance encounters, intimate exchanges and lasting friendships with some of the most iconic and beloved artists of the last century. It was 1960. Ian Hugo had just completed his ﬁlm on Venice. Anaïs Nin, his wife, was the star of the ﬁlm. Few people knew about Ian Hugo, but Anaïs’ reputation had already reached New York. None of her voluminous Diaries had yet been published; that was to come later. Anaïs had invited a dozen people that had orbited around the avant-garde arts to her house, 3 Washington Square, for a special preview of the ﬁlm. That was a very hungry period of mine and my brother Adolfas’ life. We had no jobs, no money, and no food. As the ﬁlm was being screened and everybody was involved in it, it took no time for me and Adolfas to notice that, in the back of the room, there was, prepared for the guests, a little delicate table with plates of cookies. We had not eaten anything that day. Three or four minutes before the end of the ﬁlm we snuck to the table and began gobbling up the cookies. She told us that story years later. She was wondering who those guys were. And I have always felt sort of guilty about Anaïs’ cookies. 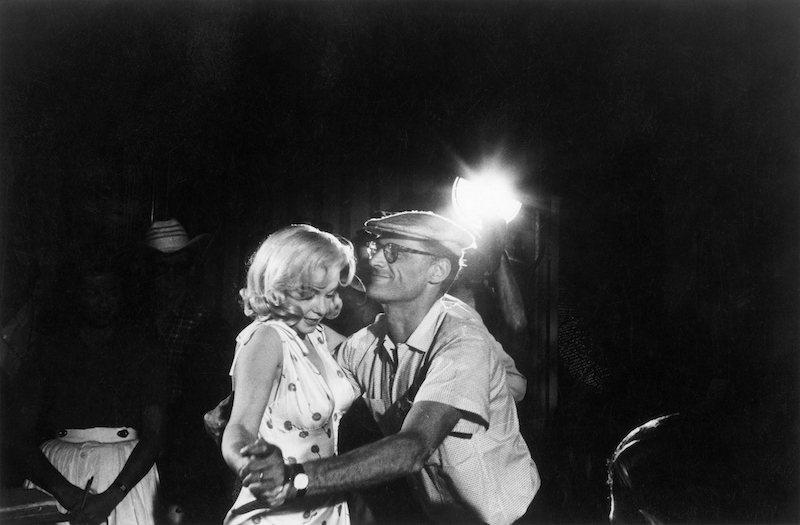 Letter from Anaïs Nin Arthur Miller and Marilyn Monroe on the set of The Misfits (1961). Photo: Eve Arnold. Visited Arthur Miller in Brooklyn Heights. The aim: to raise money to pay for the latest issue of Film Culture magazine. We still need $500 by next Tuesday. He was very happy about the magazine and said he will try to get money from some people he knows. We spent a long afternoon talking. He was complaining that nobody wants to stage his plays anymore. He was depressed and angry. He said he thinks that the only intellectuals are to be found not among the so-called intellectuals or artists, but among the industrialists, manufacturers who know that culture, arts must go together with production. In America, he said, culture is detached from politics. Politics means campaigning, elections, etc., but no cultural, ethical integration. America is where Europe was 75 years ago. The Victorian age here has just passed, and after a great confusion in every section there is a great wish for returning to the point of departure, back to Lincoln, Franklin, the Constitution. They can’t understand the relativity of history. They are taking it without adapting it to the changing times. He expressed his great interest in existentialism, especially in Sartre’s plays, such as The Devil and God Almighty, wondering why nobody has produced it here yet. 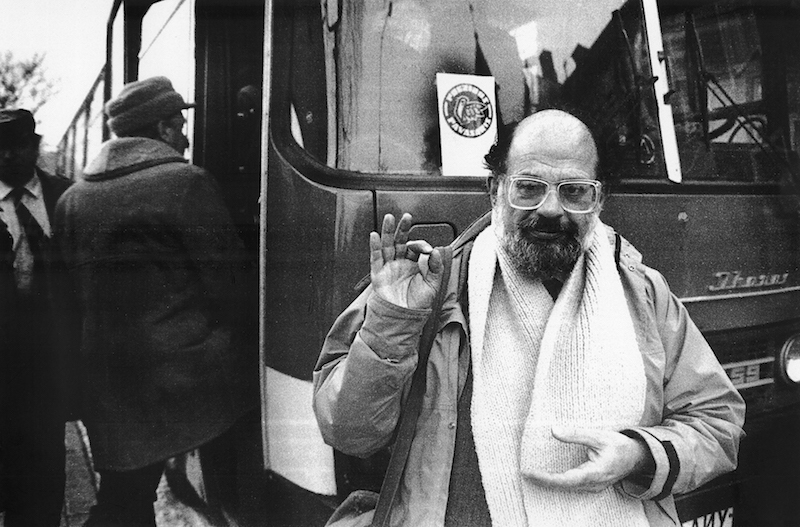 Allen Ginsberg in Vilnius, 1985. 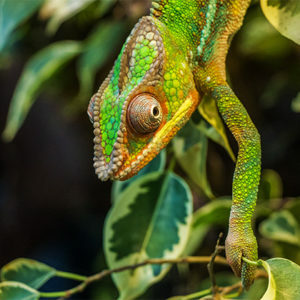 Photo: Algimantas Žižiunas. 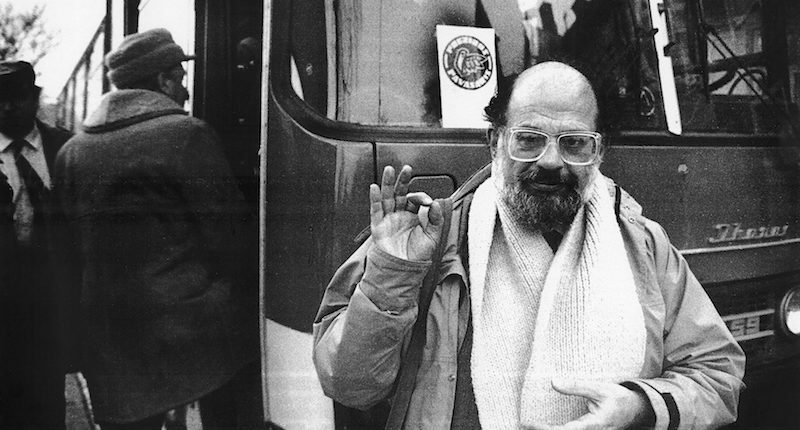 In November of 1985 Allen Ginsberg visited Lithuania, which in those days was called the Lithuanian Soviet Republic. Allen called me after his return to New York. He said he was always being followed by the secret police. They even forbid him to see his translator. I do not remember the name of his translator, I have to do some research on it, but Allen told me that one night he managed to escape the eyes of the Secret Police and to secretly visit and even have a drink with the translator. A young photographer by the name Algimantas Žižiūnas managed to take several pictures of Allen during that visit. 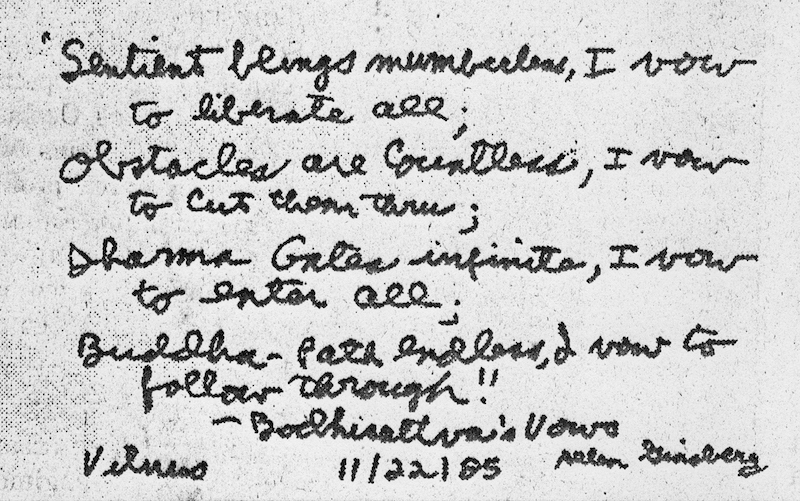 On one of them, which I am sending to you––a clipping from a current Lithuanian newspaper on the occasion of a photo exhibition in Vilnius this July––Allen wrote a poem/text which––it’s very possible––has not yet been seen here. So here it is. 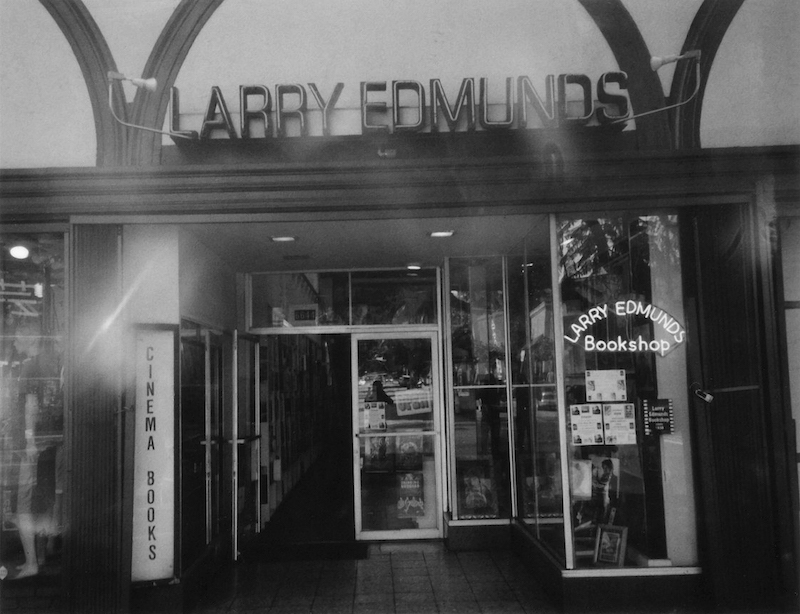 Larry Edmunds Bookshop, 2015; photograph by Scott Cambridge. Los Angeles. The year: 1958. Summer. I was visiting a friend. One evening we were joined by Richard Fleischer, the ﬁlm director. 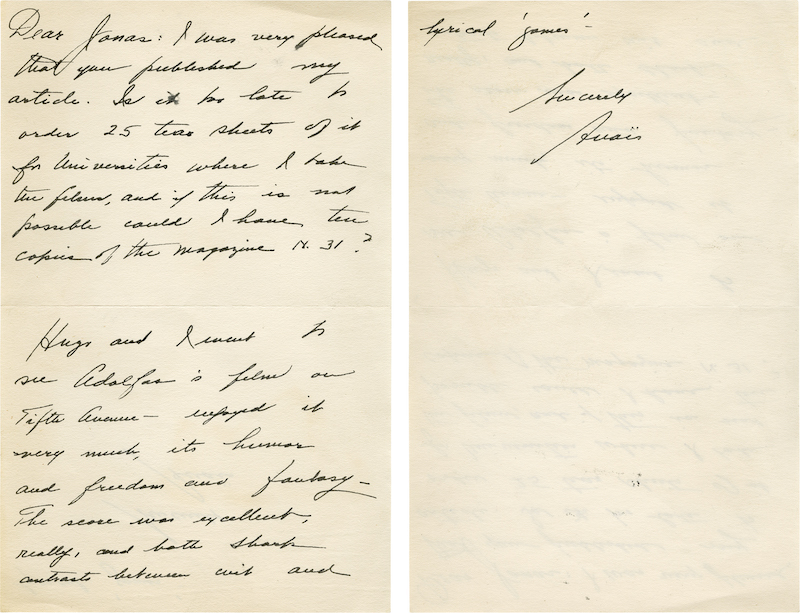 It was a time when he was agonizingly obsessed with Freud. Somehow the evening turned to psychedelics and chemically induced perceptions. Fleischer mentioned a book by Huxley, The Doors of Perception. I had never heard of the book. Next day, not having much to do, I decided to go to Edmunds Bookshop and see if they had the book. Amazing as this coincidence was, I stared at him in disbelief. Of course, he didn’t look at me, he just looked at some book he was holding. That was it. But I was thinking: What was the probability of such a chance meeting? One in a billion? Probably. From A Dance by Fred Astaire. Reprinted with the permission of the publisher, Anthology Editions. © 2017 by Jonas Mekas. Born in Lithuania in 1922, Jonas Mekas has lived a uniquely influential life as a filmmaker, writer, critic and poet. He survived a World War II labor camp and postwar displacement before immigrating to New York in 1949 to embark upon an extraordinary career in the arts, playing an instrumental role in the careers of Jack Smith, Andy Warhol and numerous other iconic artists and hanging out with everyone from Maya Deren to John and Yoko, from Tiny Tim to Salvador Dalí.